Quick! Point to your shoulder. If you're like most people, you probably pointed directly at your front deltoid or AC joint, where the clavicle meets the upper scapula. Both of these are definitely important parts of your shoulder, but the story hardly ends there. Every muscle that has an attachment to your scapula is integral to the shoulder, including the trapezius, rhomboids, and even the musculature on the ribs. Your pectoralis major has attachments on the clavicle, so it is included. Even your biceps are part of your shoulder! Everybody's in there, moving around and fighting for space. It's the upper body's equivalent of the Mos Eisley Cantina. And tightness or weakness in any of the patrons can quickly escalate into conflicts that have far-reaching effects. To make things worse, nearly everyone is tight or weak somewhere in the shoulder. Take me, for example. Given how much I can squat and deadlift, I should be able to clean a small truck. However, I struggle to properly clean my bodyweight, simply because I have trouble getting into position to rack the barbell. Others are unable to grip the bar during the back squat, or they find their impinged shoulders hold back their bench press. Because the shoulder has such wide influence, it can sometimes be hard to pinpoint particular problems. For instance, when I clean, I feel the tension primarily in my wrist and forearm, though the problem doesn't originate there. But watch me alongside some Olympic lifters, and you'll see that they are able to raise their elbows significantly higher than I can when receiving the bar at full depth. This is due primarily to shoulder and thoracic (or middle and upper) spine mobility. So, how do we increase the range of motion in these crucial areas? I've got three words for you: smash, stretch, and strengthen. Work these six simple drills into your routine and you'll receive big benefits in terms of athleticism and posture. This is powerful stuff. To get started, let's look at three rehab movements that improve the extensibility of the muscle tissue throughout the shoulder. We have many options here, but these three hit some of the most common problem areas in both lifters and the general public. 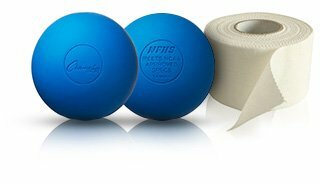 To perform this movement, you'll need a pair of lacrosse balls taped together with athletic tape. There are higher-end options, but a couple of $3 balls work as well as anything. Place them on the ground and position your spine between them, with the balls placed just above your lumbar. It's similar to the position for an abdominal crunch but far more uncomfortable. Lean back until your head touches the ground, and then extend your arms upward and perform five crunches by flexing only your thoracic spine. When you've done that, move the balls up an inch and repeat the drill. Keep repeating until you pass the shoulder blades. This drill is aimed at improving range of motion during internal rotation, which is when your bent arm rotates toward the center of your body, either when your upper arm is hanging straight down (imagine you're closing your bathrobe) or sticking straight out (imagine you're pulling a curtain down). However, having more supple tissues here will also improve your range of motion during external rotation (imagine opening your bathrobe—I said imagine it!). Begin on your back with your upper arm laying perpendicular to the body, in full contact with the ground. Bend your elbows to 90 degrees, like you're surrendering to the cops. Now place one end of a barbell on the front of one of your shoulders, and hold the other end in place with your foot on the same side. Use your opposite hand to apply pressure to the top of the barbell while you move your working shoulder through internal/external rotation. It doesn't sound like much, but remember how many different things are moving around inside your shoulder. This should hurt like a mother. If your shoulders feel weak or immobile, especially when you move your arms overhead, you could be suffering from some degree of impingement. This can come from lots of throwing, tennis serves, overhead work, or simply from doing more pushing than pulling. Whatever the reason, this one's for you. Attach an elastic band to a low anchor point. Take the band in your working hand with the elbow fully extended, keeping the palm up. Step far enough away from the band to create tension, and then turn away to facilitate the stretch. Slightly turn and tuck your head away from the working side to maximize the stretch. Hold for a couple of minutes. We've mobilized and unglued some of the most troublesome spots. Now we need to strengthen the weak aspects of our shoulders that contributed to these problems in the first place. The movements to do this aren't complicated, but because they address points that are legitimately weak in most people, they might make you feel surprisingly sore. This is a great movement for shoulder function and improving your posture. It hits several of our troublesome spots around the shoulder, including our external rotators, posterior delts, and low traps. There are several ways to perform the face pull, which can be done either with elastic bands or cables. My favorite has the palms facing forward at the end, rather than pulling straight back with the palms facing down. The forearms should end up above the biceps, not in front of them. Any coach worth their warm-up pants will tell you that to maintain healthy joint function and posture it's wise to aim for roughly equal volumes of horizontal pulling and horizontal pressing. This is how I've balanced my workload in the past. That said, I recently read an old interview with the great physical therapist Bill Hartman which made me realize I'd made an error. Hartman pointed out that both in rowing movements and in pressing movements, the scapula is supposed to retract. That means that almost all of the work in that plane is moving in one direction, which is part of the reason why I have tightness around my scapula and can't rack my cleans. To fix this, we need to strengthen the serratus anterior and develop scapular mobility. I like to do this by isolating and emphasizing the scapular movement of our old friend the push-up. Assume a push-up position with your hands close together. Relax your back to allow your chest to drop down, but don't let anything other than your scapula move. Your torso should only move a couple of inches vertically. Then protract your shoulder blades to force up your torso. The trapezius is integral to shoulder health. When you move objects overhead, the scapula needs to be able to rotate upward to facilitate the humeral position, but many of us have traps that aren't up to this task. We need to activate and strengthen them through shrugs, but not just any old shrug will do it. 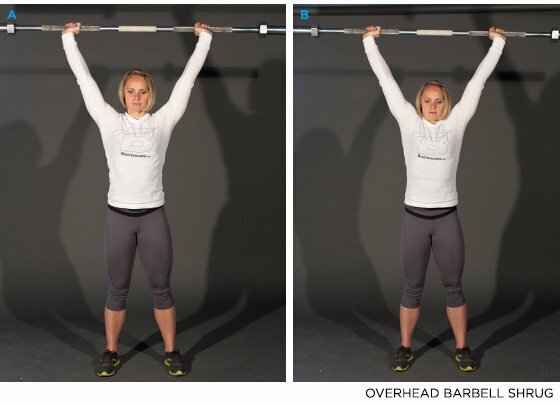 For better overhead movements—wait for it—use overhead shrugs. Press a light barbell overhead. No need to show off here. Make sure you have solid posture, with a straight line from hand to head to foot. Your lumbar spine should be neutral, and your abdominals tight. From here, slowly shrug your shoulders, pause, and slowly return to the starting position.